For the first few years of my coming to Cambodia, I came during the dry season. I remember one talk I was giving at the International School in Phnom Penh when, after the students had finished with their questions, the teacher turned to me and asked if I had any questions for them. I said, ‘Yes. Tell me, what’s it like to be in a monsoon. What do you do?’ I also remember one teenage boy had an especially impatient sneer on his face (of course), looking at me like I was an idiot. He said, ‘You don’t do anything. You wait, and then it passes.’ It’s a particularly Buddhist response, come to think of it (although this kid looked like a transplanted New Yorker), but at the time I found it surprising. It’s only now, years later, that I can see what he meant. I suppose this blog is especially for my friends and readers in the West who have never had the experience of being in Asia during the rainy season. it’s a pretty amazing phenomenon. Here’s the scenario as it plays itself out in Siem Reap. You are out and about, trying to stay cool however possible, doing whatever you’re doing. The sun is hot and the sky can be either completely clear blue, or partially blue and partially cloudy. Then, unannounced, in the distance, you might notice a very dark cloud. Give it a few minutes and then WHAM! The skies literally open and dump gallons and gallons of water everywhere – on the streets making huge puddles amidst the broken concrete, on the rooftops making a noise like no other I can think of, or on your head if you’re not careful. Most people duck under an awning or inside a building, although some just continue on, but at a quicker pace. No one really wears raincoats. Some use umbrellas, but really, they’re not always all that useful. If you happen to be inside when it happens, you ignore the whole thing, unless you’re a tourist in which case you might stop and wonder what that racket outside is all about. And then, just as suddenly, it’s over. The sky is blue again and the sun just as hot. Living with this kind of climate has two effects on the people who live with it, I think. First, it makes you a very good judge of the weather. Several times, once in a restaurant, once in a tuk tuk, I had been happily doing whatever, and then the driver or the waiter simply, calmly, stopped what they were doing, and made some adjustments. The tuk tuk driver rolled down the plastic sheets to create a protective surround for his passengers. Then he continued on his way. The waiter put down his tray, brought in whatever outdoor furniture was in the forecourt, and then went about his previous business. The first few times I experienced this, I didn’t understand what they were doing. But then, a minute later, the rains would fall and I would sit there wondering, ‘How did they know?’ Well, living in this climate you get to know these things. You become aware of your surroundings, of the sky. You become a part of the atmosphere in a way we Western city dwellers are not. I have always assumed farmers everywhere became like this, but the rest of us? Certainly not anyone I’ve known. And it forces you to learn patience, again something we Western urbanites are not very good at. Monsoon rains are not something you can control or something you can ignore. They come when they come and all you can do is wait. The rains teach you patience. Patience and awareness – perhaps the greatest difference between the East and the West. And when the monsoons don’t come? 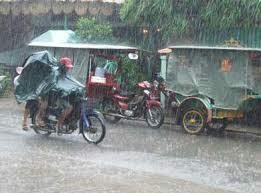 When climate change takes the rains to the streets of London instead of the streets of Siem Reap? Nothing good happens. In the West, it can mean displacement and destruction. In the East, famine and more poverty. It’s hard to be patient about that.